The office party, the Holiday drinks party, a Christmas brunch. ‘Tis the season to dress a little festively. A case in point: plaid. Buffalo plaid of black and red is all the rage this year. The jacket above is a couple of years old and was made by Southwick. The trick to playing down plaid (as opposed to playing it up wearing the clan tartan tie) is to keep the rest of the outfit low key. While the shirt is a Prince of Wales plaid with a yellow windowpane overlay, the tie is a simple navy cashmere knit and the sweater is a solid yellow (I was headed for a Christmas brunch.) For evening, I might opt for a black or navy turtleneck, or a solid blue shirt with the same tie. If you’ve got ’em, wear ’em! But have you ever worn the kilt ? 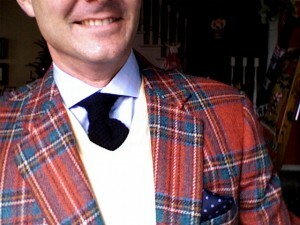 Jeeves might say of your jacket, “A trifle sudden, Sir…” but then much tartan is. Enjoy it! I hate to sound petty and snotty, but why the apostrophe (‘) after “years”? Quite frequently in these latter days, I see apostrophes used, I am assuming, to connote plural. I;m sure that’s not your intention. All critiques aside, I do get quite a kick out of your offerings. I, myself, have a red velvet cardigan-style blazer – really like a velvet cardigan sweater which I copied from an old Ralph Lauren cardigan – which I have only had the courage to wear when I am entertaining at home. I have a black one too which serves as a semi-dressy jacket just a few steps beneath black tie but it seems appropriate for our more casual life style here in Beverly Hills. But Toulouse-Lautrec once said, and I translate loosely, “those who adamantly claim to not give a damn, really do give a damn; otherwise, they wouldn’t adamantly claim to ‘not give a damn’!” I’ve kind of cleaned up Lautrec’s “not give a damn”! I’m going on and on, I’m sorry, but it reminds me of another instance many years ago. I have never forgotten the advice. Hello BevGlen, not petty or snotty. Somehow I made it through a major in English (Lit.) without having had the benefit of a grammar class. The result, I imagine, of bouncing around schools as an Army brat. I used to write well because my father was beautifully well-spoken and I was well read. I read so little these days that my grammar and punctuation has suffered. Back to Strunk and White and a good book or two. Cornflower… very funny! Here in the South, amidst the candy cane print corduroys, I am the picture of restraint. Sometimes. Thanks Mrs. PvE. I always imagine that you styled that great RL ad with the canoes and the sweeping plaid skirts on the models. All grammar aside, as long as you’re this interesting, I can stand an apostrophe or two. Or three. Have you ever seen Scott Fitzgerald’s original manuscripts and what his editor, Maxwell Perkins, had to do to get it into print?